The Snow Valley Basketball School Camps have been around for a long time! Do you know about them? Check out the clinic notes from the 2012 Snow Valley Basketball Coaches Clinic inside! Do you know about the Snow Valley Basketball Camp? Maybe these players should! Players are leaving layups on the rim. They don’t know how to pass anymore. Kids have trouble getting the ball inbounded into the backcourt. I am talking about college basketball right now. That is crazy. We have gotten away from the basics of basketball. College basketball isn’t the problem. It’s not because of AAU either. Players have a choice of going to play games or work on their game. College Basketball recruiters will always find the best players, and you don’t have to play AAU for that to happen. Kids are getting confused with trying to be like their favorite NBA star on Sportscenter. When did old-school basketball become uncool? It’s everywhere right now. The Snow Valley Basketball School was a staple of my coaching when I grew up. I learned from a coach that attended it. I was invited to participate and be a camp counselor there but unfortunately didn’t make the trip from Oklahoma to California. Right now some European Basketball Federations won’t let their athletes play college basketball without their permission. It’s because of the lack of fundamentals and shooting in College Basketball. 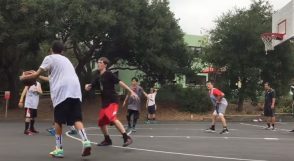 A lot of NBA teams are hiring skill development coaches to teach remedial basketball lessons in basic footwork that use to be a staple of any college basketball practice. Players have no moves or no shot. They are looking for a great dunk. They are out of position and always outsmarted by some European players. The Italian Federation use to invite a NCAA Division 1 coach to its clinics, but they quit that practice. Footwork lets a player find space to take a shot. Do kids learn the rocker step or drop step anymore? How many high school and college coaches are running ball screen offenses right now? Do we teach individual skills for guards and post players anymore? The next great post player is probably setting screens instead of his back to the basket. The NBA Draft and Off-season has the NBA one of the most popular sports right now. During the NBA Draft, I heard announcers talk about potential all the time. The player’s race through college and land on the NBA doorstep. They can run, jump, and dunk over you, but they have trouble learning how to play basketball. Everyone wants to dunk or shoot the three, but they don’t have the footwork for the mid-range game. It takes time to teach those skills. Back in the day, you had teaching camps like Howard Garfinkel’s Five Star Camp on the East Coast and Herb Livsey’s Snow Valley Basketball School on the West Coast. Fundamentals were taught, and they did things old school. It was their selling point. Dribbling is an individual skill that is as good as ever, but it’s not a team skill. Passing use to be the way that teams beat you. Now it’s more off the dribble like ball screen offenses. 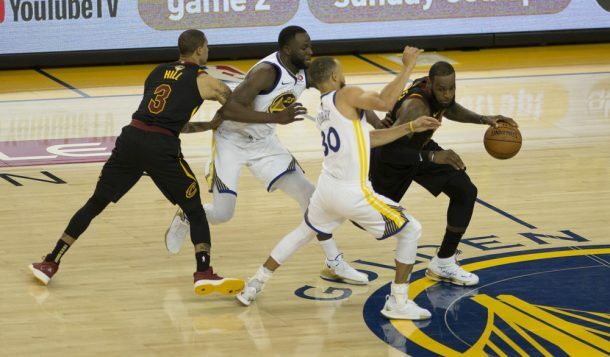 The Golden State Warriors move the ball more than any team in the NBA, but that isn’t the norm. During the NBA Draft, the announcers would say that the typical college basketball player was raw, had a healthy body, and a freak athlete. Never did they say that many of them were a polished player. Kid’s don’t practice anymore. If you ask a child when you can watch him, he doesn’t have a clue unless they have a game scheduled. Some of the best college basketball teachers are on the NCAA D2, D3, and NAIA levels. They are the coaches that aren’t getting the best athletes and have to teach them the game.